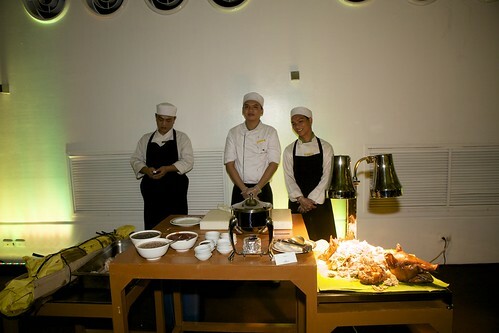 It wasn’t until after the ceremony that I found out that Julia and Toby held their wedding in Cebu for one reason: The food. They both have family in The Philippines, but mostly in Manila and hour’s flight away. 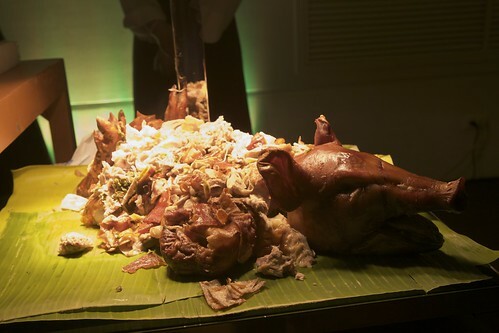 Instead of gathering friends and family there, they chose Cebu City, the home of a particular type of lechon or suckling pig. When I found out they’d be serving this regional specialty, I rushed the serving table. But I didn’t go straight for the food. I hit up the carving chefs to find out more about the preparation method. From what I could gather, the cavity of the pig is stuffed with lemongrass, soy sauce and other ingredients I I couldn’t quite make out. It’s then sewn together or wrapped up and roasted for hours. I carved my first serving from the head, getting some tender cheek, crunchy ear and sticky, chewy snout. At the table, a neighbor recommended that I try the belly area where the flavors of the seasoning really stood out. The lemongrass was powerful and the soy was a little too much, making the meat saltier than my liking. Ever since I had it at the wedding, I’ve been thinking of how to reproduce it at home. Time got away from us over the holidays and we didn’t end up having our annual pig roast, but some time this year, I hope to try my hand at a Cebu-style pig of my own. A little googling turned up recipes for the pigs that Anthony Bourdain ate on his Philippines episode of No Reservations. I know what the main course will be at my next party!